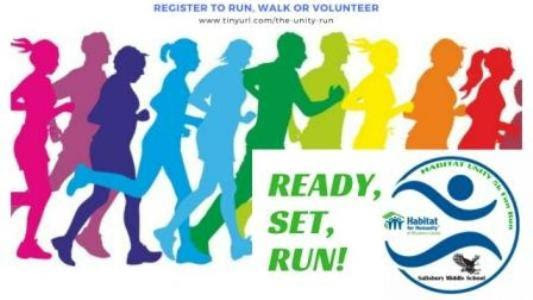 PLEASE JOIN US FOR OUR FIRST RUNNING OF THE UNITY RUN 5K! This race will start and end at Salisbury Middle School in Salisbury, MD and will be a road run through 3.1 miles of our surrounding roads. Come out and join the local community in celebration of all that we have accomplished together for Habitat for Humanity!! Registration includes a t-shirt, bib, food vouchers, and other goodies from our local sponsors. Discounted price and Guaranteed T-shirt if you register before June 3rd! We will have local concessions and vendors on site while the race is happening and there will be kids activities all morning. Race Day Registration and Packet Pickup is 7:30-8:30am and the race starts at 9:00am!